Hello again. Big and little cars for sale in this newsletter!!!! Also some new staff for you to meet and an illegal immigrant! I have mentioned a few times that I have quite a collection of model cars. These are displayed in my office and behind the service counter. 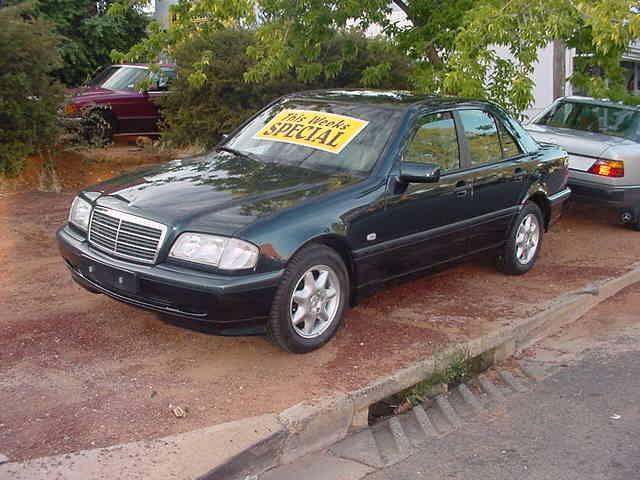 Many of our customers have asked if the cars are for sale and for many years, the answer has been NO! However, we are now glad to announce that we are going into the Model Car business! We have several brands of cars that we will be offering for sale and are going to try to concentrate on models that are not commonly available at toy shops. The car on the right is an excellent example. There are many models of the W107 SLC on the market, but this is the only one of the famous 450SLC 5.0 (or 500SLC as it was later known) rally cars that were campaigned by Mercedes-Benz in the World Rally Championship from 1978-80. This is a 1:18 scale model and is made by the Ricko Company. 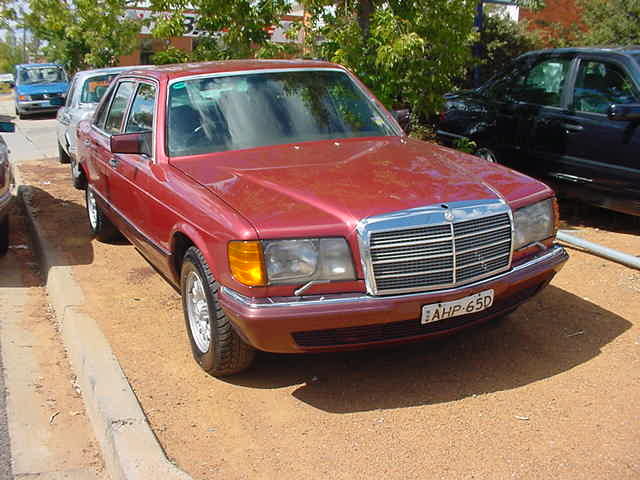 They also make a plain 500SLC (no bullbar, etc) in either red or champagne. Cost is $65.00AUD. Send us an e-mail here if you are interested in this model. Two other 1:18 scale models that we have in stock are a 1954 300SL Gullwing, as campaigned in the Pan Americana race. This was the race where the eagle smashed through the windscreen. Finally, we have a 1928 630K. All models come in a nice presentation box . Price for these two models is also $65.00 each. E-mail us if interested. This weeks special is a deal on the new range of model cars. Two cars for $120.00 plus $15.00 for Australia wide delivery for both of them. This is a saving of $20.00. Numbers will be limited so if you are interested ring John or Bob on our toll free number 1300 787 300. Or send Bob an e-mail. Over the last two weeks I have written a two part article for the Mercedes Veterans mailing list. Below is a copy of the first part. I will follow this up with part two in the next newsletter and some pictures that show what its all about. 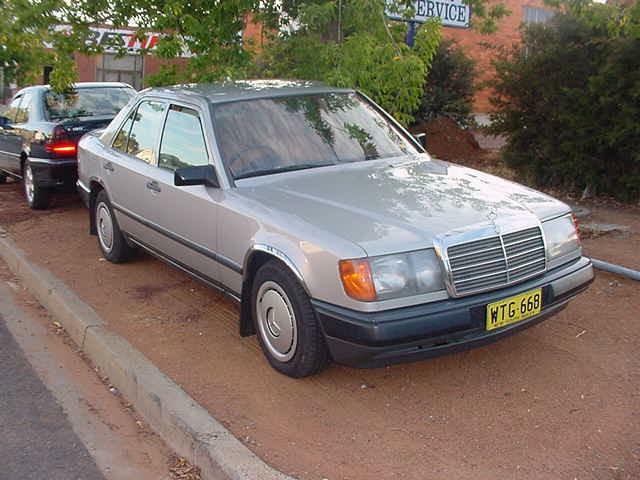 The Australian cars had the same system as the European version and I believe the early US spec cars. 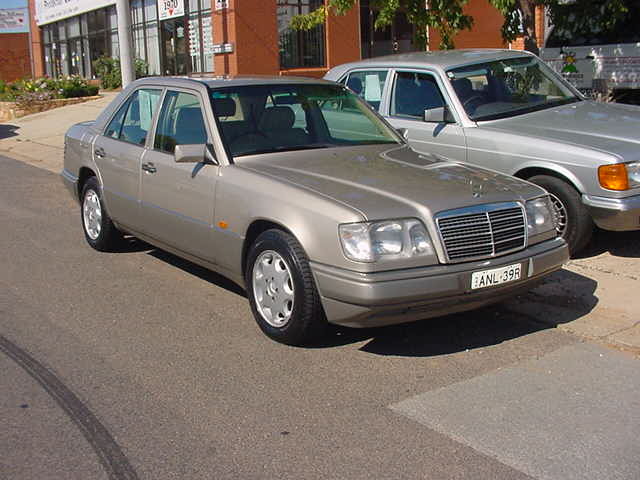 Later US spec cars had a totally different climate control system..
-Firstly the Euro version of the W116 had ONE heater tap that, in true German style, is controlled by one of TWO switches. The heater tap is a basic valve that is controlled by a vacuum diaphragm. When you apply vacuum to the tap it reduces the flow to the heater core. When there is no vacuum to the tap, it is open. It is either off or on, there is no "somewhere in the middle". You can find your heater tap on the engine side of the firewall. It has a red vacuum line going into it. - The vacuum supply to the tap is controlled by a pair of valves in the console that are linked to the two levers that control the heat. This, in my opinion, is one of the major design faults with this system. If you have a vacuum problem, the heater jams on rather then off!! - The vacuum lines are laid out like this. Vacuum is sourced from the inlet manifold of the engine or, in the case of a diesel engine car, the vacuum pump. Somewhere on the fire wall, you should be able to see a heap of vacuum lines and one way valves. The valves are normally blue and the line that you want is normally red or red with a green stripe. From the fire wall, the red/green line disappears into the fire wall and comes out in the console. If you pull out the radio you should be able to see it. The vacuum line goes into a vacuum switch and then into another switch. On a RHD car the line goes into the r/h switch first and visa/versa on a LHD car. From the switches the line turns to a solid red line and goes back thru the firewall to the tap. - When you sit in the car and lift the heat adjusting lever up and down it does more than just operate the switch mentioned above. It operates a complex series of levers and flaps that regulate the amount of heat that you get. Remember that the heater tap is either off or on? When you start to move the heat lever up, if the system is working correctly, you will notice that you need to overcome some initial resistance. This is the vacuum tap opening. The rest of the movement is the flaps over the heater core moving. These flaps control the amount of air that can flow over the heater core and thus the amount of heat that you get out the air vents. Firstly, I have just realised that we have forgotten to inform you of a very interesting car that came in for dismantling about six weeks ago. It is a 1964 220SE COUPE. 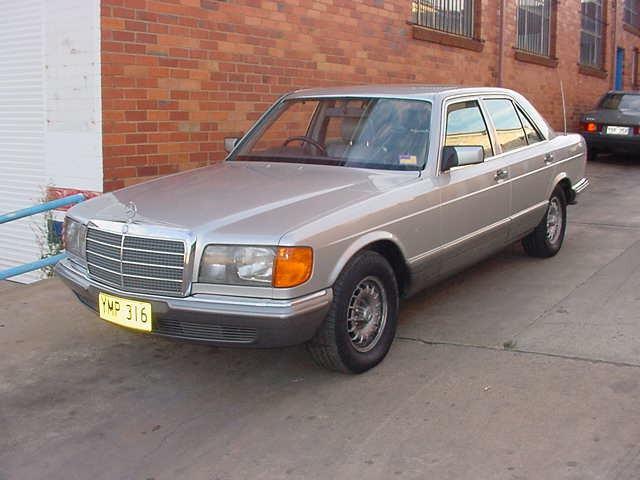 As far as I know it is the only W111 coupe to be dismantled here in Australia for some time! The tail lights are already gone and so is the rear bumper. So if you are looking for some hard to get Coupe parts send us an e-mail. 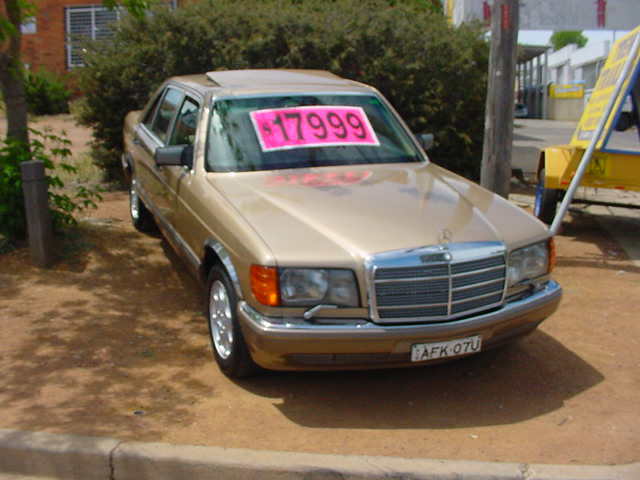 A few years ago there were several amendments made to the legislation covering the importation of used cars into Australia. It was jokingly called the "Rizzo amendment" by people in the industry. This was because all the amendments were to plug loop holes that a certain Mr Rizzo had spent his efforts exploiting. (this is another story in itself). Anyway one of the amendments was to ban the importation of complete cars for dismantling that were under 15 years old. Old Mr Rizzo had imported heaps of these cars supposedly to dismantle, but was using yet another loop hole to rebirth them and register them. 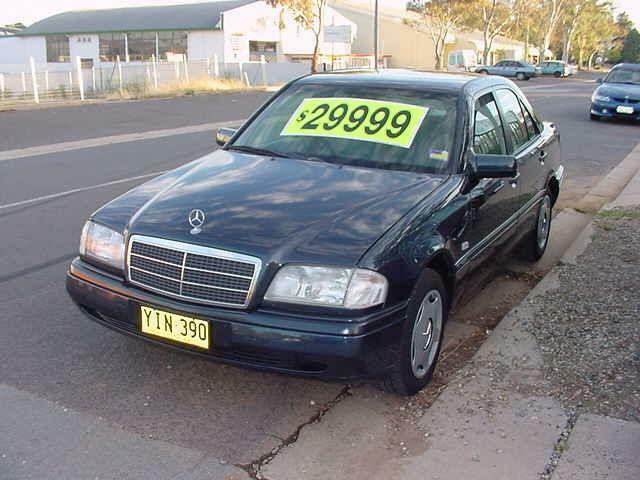 These cars are commonly referred to as "illegal immigrants"
Anyway, there were heaps of these cars left here in Australia that were not registrable. Over the years we have had a few turn up that we have dismantled and I know a few other dismantlers that have wrecked some. I thought they had all been turned into recycled tin cans until the other day when a chap turned up with a 1989 190E that he wanted to sell. 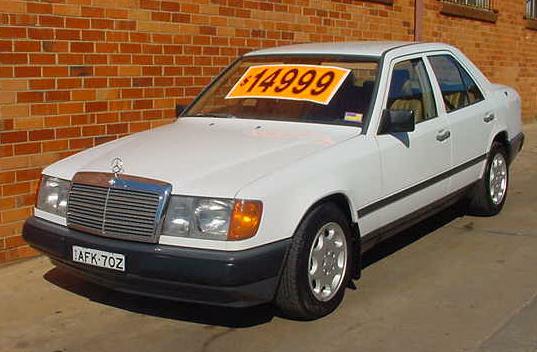 Sure enough it was one of the Rizzo cars......... Its a nice little car, with the late style body kit (looks like a 180E), it also has electric windows and a good cream MB-tex interior.